And I apologize again for re-re-re-REwearing clothing... I was like "whatever I just need one look to do a remix with this shirt...so let's get it over with!" (even though I know I'll wear it again soon lol). This Monday was Labor Day in the U.S, which meant no-school and no-work.... so it definitely felt like a Sunday and Sundays were made to sleep until noon!! So that's what I did before going to a park with Chiki in the afternoon, and then later I headed to my boyfriend's place since his family was cooking. My dad ended up starting a couple of final projects for the university... it definitely felt like a Sunday. I hope you liked this comfy look with sandals and fun snakeskin shorts! XOXO and big kisses from Chiki!! Me vuelvo a disculpar por requete-repetir la ropa, solo me faltaba un look con esta camisa para hacer un remix...así que preferí salir de eso de una (aunque creo que me gusta tanto que seguiré actualizando ese remix mientras la vaya usando). Este lunes fue día feriado en Estados Unidos, razón por la que se sentía totalmente como un domingo- los cuales fueron hechos para dormir hasta el mediodía!! Como estaba en modo domingo, opté por un look cómodo con sandalias, blusa ancha y unos shorts divertidos de estampado de culebra. Pasamos parte de la tarde en un parque con Chiki, el cual tenía mucho tiempo sin salir en el blog pero aquí está otra vez! De ahí fui a casa de mi novio donde su familia estaba cocinando y mi día terminó haciendo tarea para la uni.... suena como un domingo ¿no? Espero que les haya gustado este look relajado! ¡Abrazo!! ¡Y besos de parte de Chiqui!! your shorts are amazing! love the whole look! Danyyyy!♥ tiempo sin escribir en tu blog!! Siempre viendo tus outfits!! este me encantó, el short es definitivamente encantador, espero ansiosa como lo usaras y transformarás!! Sigues siendo mi inspiración! 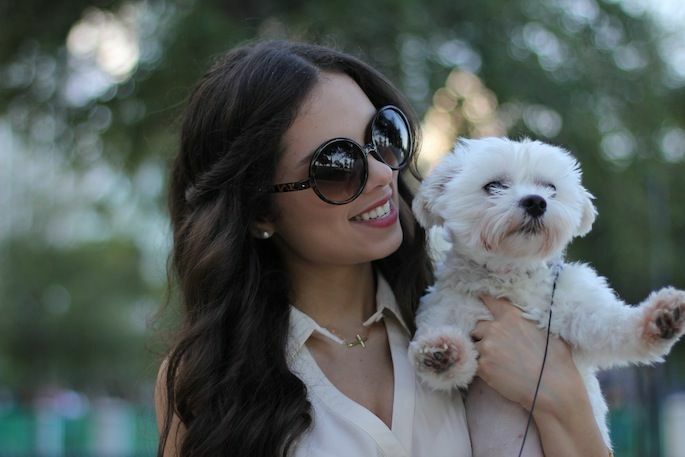 Tus lentes short y cabello están hermosos! <3 <3 y chikis se ve tan bonito, me pregunto como le hace tu perrito para sobrevivir con el clima de Miami ¿no se enferma a menudo? amazing shorts! 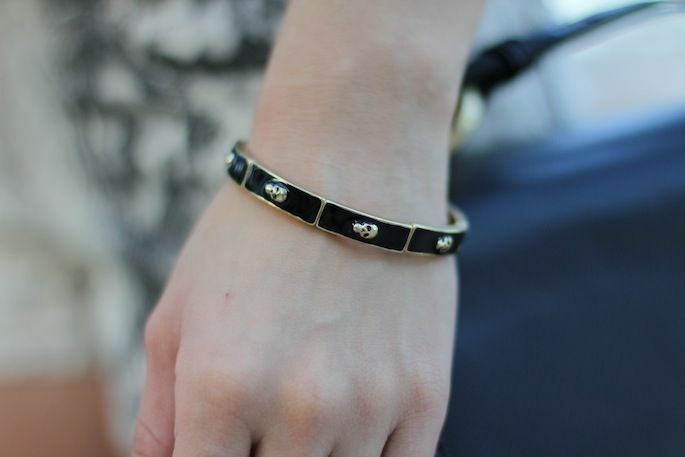 I have that arrow bracelet ;) love it. Love the shorts ! cute puppy too ! Love the whole look! Great outfit! I love this outfit, so cute and comfy! Love this look, Dany. The shorts are gorgeous, and I really like the skull bracelet! Such a comfy but chic look for the beginning of fall! Love your shorts! they are amazing! And your dog is so cute! Love your outfit Dany!! those shorts are super cute! so casual and chic! and Chiquis is super adorable! Your shorts !!!! Los amooo!!!! Such a cute look, love the shorts! Love the blouse and the shorts! Cool shorts! I wish I could stilll wear such light outfits too! Why apologize for re-wearing clothes! We all need to do that - plus when you pair things differently, it's a NEW outfit, an this one looks AWESOME! LOVE those shorts! Fantastic look! I love these snake-printed shorts! La perrita me la como, que monada! Yo es que cada vez que visito tu blog me sorprendes... me encantan tus looks! Este es ideal :) Espero que hayas disfrutado del día. looooove your beautiful snake shorts and also blouse! You look great. Love that ring!!! Is it House of Harlow? Love your shorts, i am sure they look great with many tops! I really like the cut of this top! Me encantas los shorts! y todo el look está hermoso! Love the print of the shorts! super cute and chic! Me encantan los shorts! Y tambien tu perritoooo <3 Que monadaa! !